Tired of running out of pot? Let’s grow a pound!! SeeMoreBuds shows you how to always have a large stash on hand for you and your friends. Topics covered by Let’s Grow A Pound include selecting equipment, garden set-up, security and odor control, making clones, and, of course, harvesting the results of your labor. 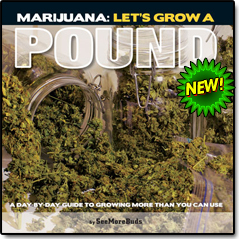 Let’s Grow A Pound is the ultimate companion for anyone who wants to grow more marijuana than they can use. Marijuana: Let’s Grow A Pound, a new grow book for indoor gardeners, shows how to always have a large stash on hand for you and your friends. It clearly and concisely explains how to grow a “golden garden”—a pound of marijuana—using the simplest, most effective techniques available. The book uses a visual day-by-day format that lets readers really see what is happening. The daily growth of the garden is displayed with up-close, full color detail so you can compare your progress to the author’s garden. Day 1: of the garden begins with the seedlings in the closet under HPS light. Fast forward to Day 16 and there’s a lot more green in the closet. Day 21–25: Growing from seed means the possibility of male plants. Some are identified and tossed. A few pages later the book covers cloning so that your next garden will be all female. Day 47: The bud takes shape and smells great. Ten days later the cola is impressive, but we’re not harvesting. Day 70: Harvest time. The goal here is a premium crop, so wait for full ripeness—take a look through a magnifying glass to see the trichomes. The book goes into the harvesting, curing, and manicuring processes in detail. SeeMoreBuds is a protégé of marijuana cultivation legend Ed Rosenthal, who challenged him to run two competing gardens, one with CO2 and one without. The book follows both these gardens and the results of this experiment are impressive: The CO2 enriched garden definitely increased the yield, delivering close to 2 pounds. Using CO2 will get you more bud for the same electric bill, and the extra yield from your first grow will more than cover the investment in the equipment. SeeMoreBuds, author of the earlier smash hit Marijuana Buds For Less, is a thoughtful and observant gardener who places an emphasis on getting the most bang for your buck. Let’s Grow A Pound covers more sophisticated grow methods while sticking to this low-cost mentality. He also includes factoids and philosophical quotes throughout the book so you’ll have something to contribute to the conversation while enjoying the fruits of your labor.